Google Talk to Books is a machine learning model build by Google, which got trained from a library of over 100,000 books; where Google search uses quality signals to understand the relevance of a web page. Google Talk to Books uses a machine learning model that looks at every sentence in over 100,000 books to find the responses that would most likely come next in a conversation. In short, this is a predictive model trained on billion pairs of statements. Our approach was to use billions of lines of dialogue to teach an AI how real human conversations flow. Once the AI has learned from that data, it is then able to predict how likely one statement would follow another as a response. 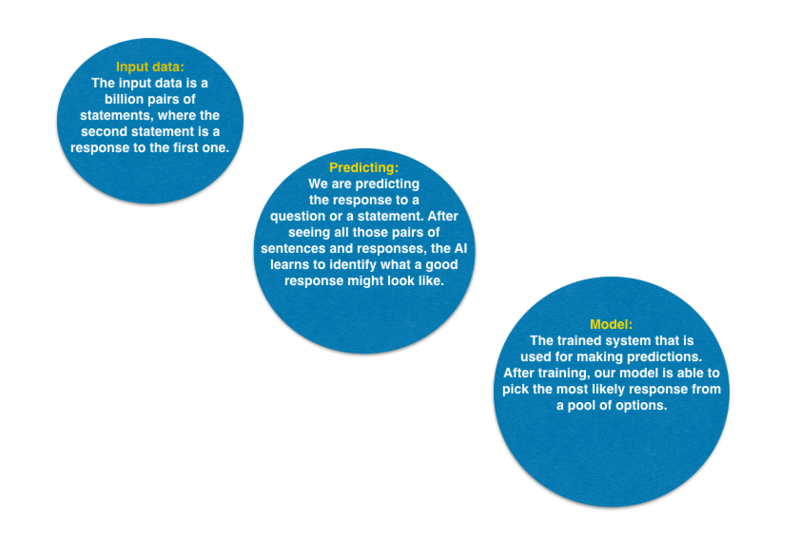 In these demos, the AI is simply considering what you type to be an opening statement and looking across a pool of many possible responses to find the ones that would most likely follow. Why is this special at all? How does Google Talk to Books work? When you input a question in the search box, you will get an answer coming from a library of over 100,000 books. Yet this is not keyword matching. Instead, the machine learning model looks at every sentence in over 100,000 books to find the responses that would most likely come next in a conversation. The response sentence is shown in bold, along with some of the text that appeared next to the sentence for context. Once again, this approach is entirely different from the traditional search. Even though I used the term “search box” don’t be fooled. In fact, in conventional search, Google looks at signals on a web page to assess the relevance of that page compared to specific keywords. There is also an AI part that leverages on RankBrain to understand the intent of a query. Yet his isn’t a predictive model. In short, based on that assessment Google will give back results. In Google Talk to Books instead, the model predicts the answer, just like in a human conversation. However, in Google Talk to Books, there is no assessment on how authoritative might be the book from where the answer is coming from (which instead is a primary metric in Google search). Instead, it simply gives you back the sentence that seems to pair best with your query. So the question is: what can I use this for? The tool is quite good at gathering definitions. However, it is as good as the books available. Talk to Books is an exciting tool for which there might be several applications for your editorial strategy. You’ll have to experiment a bit and find what answers would be most useful for you to discover through it. Google Talk to Books is a machine learning tool built on a predictive model, which based on a question you might have it will predict the answer, pretty much like in a human conversation. The great thing is that you can talk to it using human, natural language. This tool can have a lot of applications. However, you need to finetune it to understand in which way it can help you enhance your creativity and make your editorial strategy more effective! Previous Previous post: Why Is AWS so Important for Amazon Future Business Growth?